I love to throw a party–a full-out themed birthday party or a simple dinner party. I love the creative process involved, and I love spending time with people I love with good food and drink. At our house good drink is non-alcoholic. 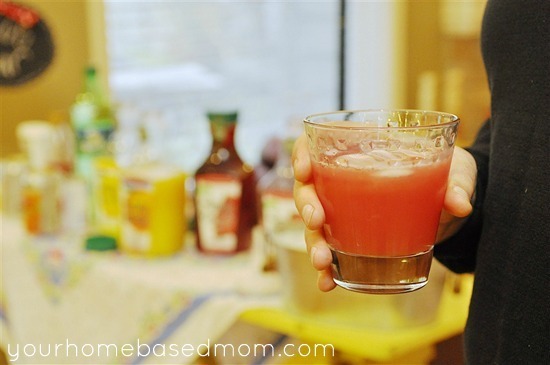 At a party I recently hosted our good drink was fruit juice. I love having my guests get involved with the food, and so I love to do “food bars or drink bars” where the guests actually assemble their own food. It also cuts down on the work for me as the hostess. I don’t have to spend all my time in the kitchen; I can be part of the party, too. 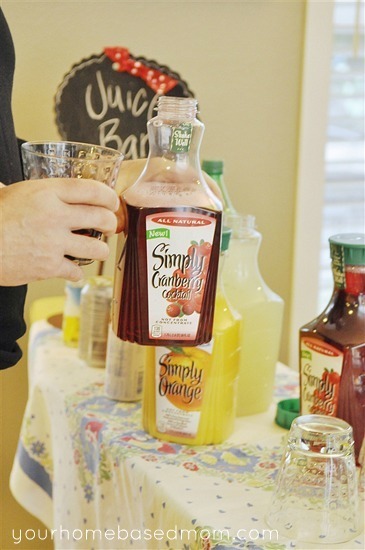 At my most recent party, I put together a Juice Bar starring a new product by Simply Orange Juice Company – Simply CranberryCocktail which they asked me to try. I also made them work for their dinner. I’ll be posting about that tomorrow. 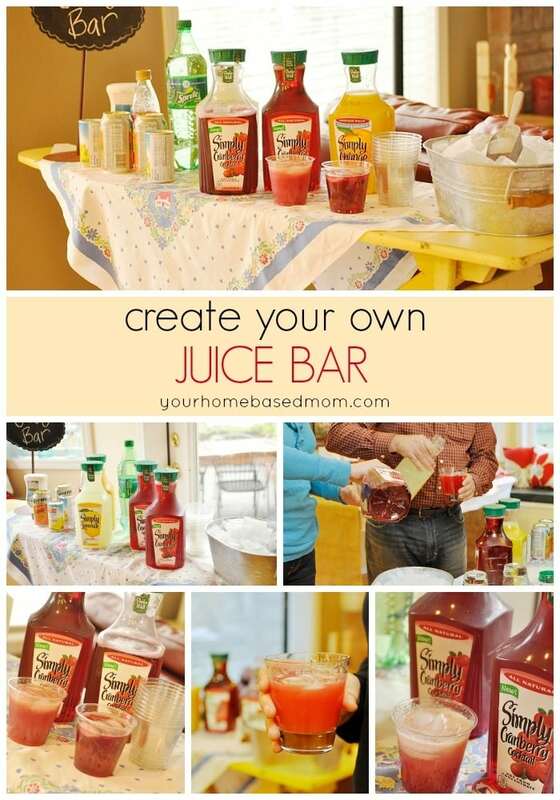 Host a Create Your Own Juice Bar at your next party! For the Juice Bar I covered my old vintage ironing board with a vintage table cloth. 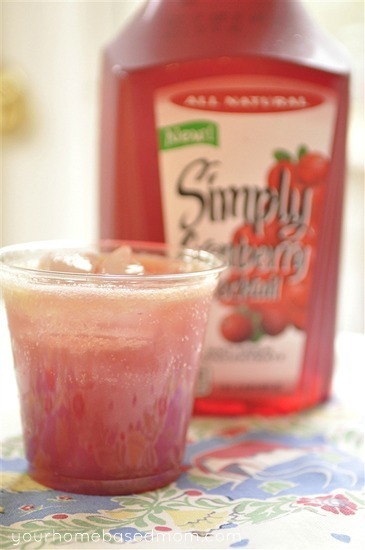 I provided a selection of juices including Simply CranberryCocktail the newest in the line of Simply beverages as well as Simply Orange® and Simply Lemonade®. In addition we had some other “mixers”–peach juice, apricot nectar, pineapple juice, coconut, and lemon-lime soda. 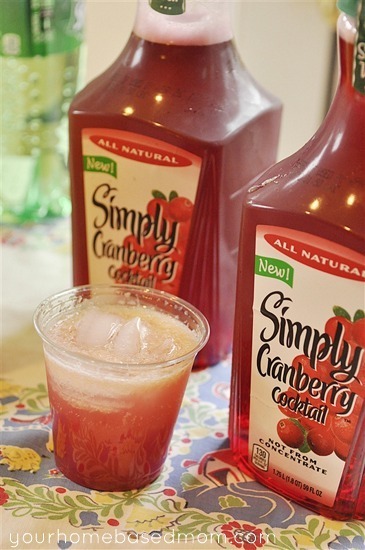 Simply CranberryCocktail is not made from concentrate so it has a fresh, pure cranberry taste, both sweet and tart and just a little different than the other cranberry cocktails you may have tried. Because it has no added preservatives you will find it in the refrigerator section of the grocery store; it is chilled from the time it’s blended. It was fun to see how creative everyone got with their juice mixtures. Simply CranberryCocktail comes in a fun carafe so no need to pour it into a pretty container; it comes in one, either 59 oz. or a smaller, personal size of 13.5 oz. Some of our other favorite juice bar combinations were: Simply CranberryCocktail, pineapple and lemon lime soda; Simply CranberryCocktail, orange juice and lemon lime soda; Simply CranberryCocktail, peach juice and lemon lime soda; Simply CranberryCocktail, lemonade and pineapple. I highly recommend a Juice Bar at your next party or dinner party. People love the hands-on process and being able to experiment with all different combinations. As the hostess you provide the ingredients and let your guests do the mixing! Simply CranberryCocktail is also giving away a $100.00 VISA card to one of my readers – how cool is that? What is your favorite way is to make a party or get-together at your home more festive? Tell me about it in the comments for the chance to win a $100 gift card! I love to make fun cocktails to make the party more festive. It gets all the people more talkative and outgoing and makes them relax. 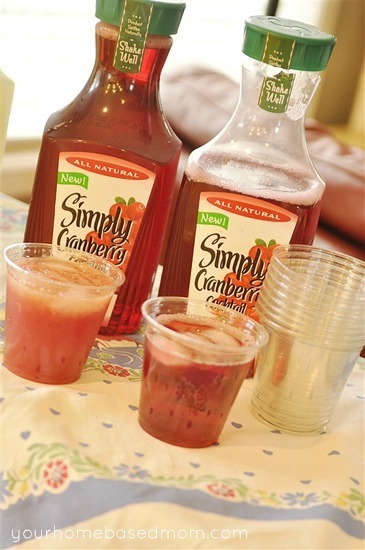 I can’t wait to try Simply Cranberry! I love this idea for our annual picnic, love you yellow ironing board. Every party needs a good drink! Like you we go non-alcoholic, so we are always looking for a good mocktail recipe. For me it’s all about the decorations. I like fresh flowers, or even just the cheesy old school streamers and balloons. i ask everyone to contribute a little something to the feast. it usually gets people talking about their stuff. fun cups or glasses with decorations or straws! I love Simply Lemonade, but haven’t tried the cranberry yet. Guess I’ll be headed to the grocery store today! Decorations around my home. If it not a holiday I would come up with a theme and have items around the house using my theme. I really love the idea of “make your own” foods at a party. For instance, when we have family get togethers, they top their own pizza, create their own salads from a salad bar, and stir in their favorite ‘mix-in’ for lemonade: a spoonful of strawberry, raspberry, or blackberry puree is stirred into their glass of lemonade. This is finished by a sundae bar with their own choices of ice creams, toppings and syrups. Fun!! Flowers and music make a party more festive for us. I love doing serve yourself bars or buffets too, since my favorite way of entertaining is keeping it very casual! LOVE your juice bars idea! I try to keep it casual, as long as there is great food there will be a great party! Most of our parties are family oriented. Having an amazing family and fun friends makes our parties festive…. and good food, decorations, and sometimes games help, too! We love to entertain in the summer on the deck. I love to have a theme–color or otherwise–to really help pull everything together and make it look cohesive. 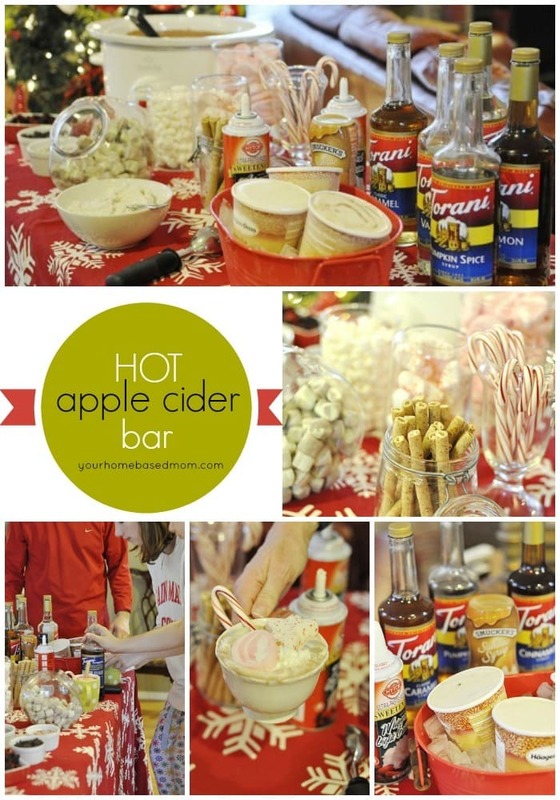 I also love to have a ‘bar’ where guests can have fun putting together their own dessert or drink! I like to light candles and create the “mood” for the party. Music is also a must! LOVE the non-alcoholic ideas. It’s always a struggle when I have parties with friends expect alcohol. This would be an EXCELLENT way to show them how tasty “mocktails” can be! Thanks, Leanne! I’ll be doing this at our next booster club meeting FOR SURE. I love to find cute ways to decorate the area that I am serving from, whether it’s a buffet or table. Just did an Italian Soda Bar for a party. Maybe I will try this for a summer party I am doing. Thanks! I like to keep things as simple as possible. I want people to feel relaxed and at home when they come to my home. I use (unscented) candles and low lighting and always have a small task for each guest (setting out a dish or stirring up some salsa) – anything to get them involved and talking with each other. I’ll have to give the Simply Cranberry a try. Sounds delish! I like to have the party outside with pretty little lights around the yard. My favorite way to make a party great to have lots of activities to do! Thanks for this post–I’ll do this on Friday for my daughter’s 13th birthday party! Love the juice bar idea with all the combo’s of mocktails! I like to incorporate my vintage and new QUILTS in the decorations. Everyone loves quilts, and they are so warm and welcoming! I think that the decor has a lot to do with a lively party. I like to decorate according to the theme with bright colors. I like to make the details count. I make lots of lists and check off each thing as I do it. I had a 25th wedding anniversary party for my sister & brother-in-law recently where I used upside down wine gasses with a rose under the glass and a candle on the base of the glass (idea from Pinterest) for centerpieces for the tables, I also set up a display with their wedding picture and a recent one, as well as candles & flowers, & their original cake topper. Also some white chocolate dipped oreo cookie pops I created as a take home favor for the guests. I really feel “it’s all in the details” to make a successful party. I love all your party ideas, LeighAnn, and I have used several of them in my parties! I think this is an adorable idea and I’m going to use it at my daughters birthday party. I like to put out items that get people talking like scrapbooks and simple games. I can’t remember the name of it but, we used to have a book full of conversation starter questions that was fun. I love having parties too! I found a very easy way to make a house look like a party is BALLOONS!! They aren’t just for birthdays!! If you get the latex ones they are cheaper and you can group them all over the house – tie them to chairs – group them in corners – high and low – and it’s a super inexpensive way to make the room look festive! You can color coordinate with your theme. And if you buy balloons in bulk through a party store or website – they are far cheaper – then just take them the morning of the party to be filled (if you do it the night before with latex they will be on the floor by morning). My favorite to make a party or get-together at your home more festive is to decorate with lots of bright color, party lights, and colorful glitter! I LOVE the idea of a juice bar!! I’ve done hot cocoa bars, coffee bars, etc. at events, but for a summer party this is a a FABULOUS idea. I also find that it’s fun to invite your guests to bring a dish that fits in with a particular theme. We had a book club party where all the guests brought a dish that represented their favorite character in the book. I also had a “Wish I was on Vacation” party where everyone brought a dish from their favorite vacation destination – just a fun way to have help with the food but also give people a chance to express their own tastes in food. THEMES. We do get togethers with all of the family once a month and I love focusing on a theme. Always so much fun. I think a punch of any kind or special dessert make any party extra special. Thanks for the chance to enter. I am always trying to do a fancy drink, we also don’t drink alcohol, so that makes the hunt for something new and exciting all the more fun. I love having some kind of a theme, and have everything go with it. I like a theme… decorations and food all going together. I add something homebaked, I think a juice bar would be a nice addition to that! I love to have some games. Badmiton, ladder ball, bocce ball….anything to get us up and moving around. LOVE to do candy bars at showers and parties. Great way to send off the guests with a nice sweet treat! I love to have a theme and work the decorations, food and activities around it. My husband loves drinks, he would just skip the rest of the food and enjoy the punch, so we always have to have a special drink. I love the juice bar idea, can’t wait to try it. My favorite way to make a party festive is with a fun dessert…..my favorite part of any meal! A few cocktails, and lots of good music and great food … always gets the party started. I like to make a party festive with themes of some sort. Themed food is fun. A tradition in our family is to choose a goofy movie (like Napoleon Dynamite), and create the menu around the movie (“Napoleon, give me some of your TOTS!”). I do draw the line at cracking raw eggs into my juice, though ;). What a great idea! Thanks for hosting the giveaway! Great idea when hosting a party. Good idea for at school for those special events! I like the guests to be in the festivities…Like I will throw an 80s party…with food that was big in the 80’s…nostalgic candies and then have the guests come in some 80’s attire…Love throwing parties! I love the juice bar idea! My family is definitely a fan of the “Simply” juices. I am tucking this idea for our next brunch or lunch get together! I think a special drink makes a party extra special. 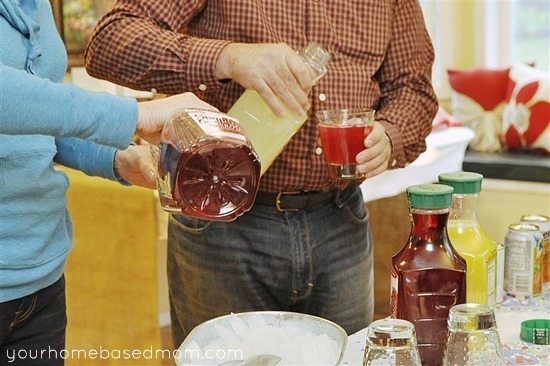 For Thanksgiving, we freeze cranberry juice into ice cubes and add them to ginger-ale or apple juice. I like to re-name the party food for the theme of the party. For my son’s b-day party, we had a reptile party with snake skins (potato chips), lizard tails (carrot sticks), chameleon clubs (sandwiches), and chameleon kebabs (rainbow colored fruit kebabs). The kids loved it! to make it more festive, I like to use pretty containers/dispensers, I often cook everything from scratch but even when store-bought, I remove it from the original container and put it in a pretty bowl, basket or tray. I have a couple of dispensers for drinks too. Even o.j. looks fabulous in a glass dispenser. for my daughters wedding we had a lemonade bar with different syrups and everyone loved it. we like to keep things simple like bbq’s and salads! I love to have punch at a party. It’s one of my favorite drinks that you only really ever get at a party. A good dessert/candy bar is so good for a party. I love to have a party with dips and things. Guacamole and chips, vegetables for dipping and fruit with a sweeter dip. Thanks for all the great ideas you have given me…..my family loves, loves, loves your breadsticks recipes! It’s always fun to use the seasons for inspiration with food/decor. Super excited for the summer parties/bbqs. The juice bar would be fabulous with a BLT and salad. We are ready for summer at our house! To make the party festive–the house has to smell good with a candle! I like to have the guests play a game, like a treasure hunt! I like lots of casual finger type foods and desserts. I always make sure we have beautiful table linens. If someone who I have invited to the party or event is having a special birthday or celebrating something special, I serve them using our Red “I am Special” plate. Our family always likes to do a sundae bar with all the fun toppings! Lots of fun finger foods to start out with. Or sometimes that is all we do, just have everyone bring their favorite appetizers. Always plenty to eat! I like planning events (Bunco, Book Group) around a theme. For the book Secret Life of Bees, all of the foods I served began with the letter B (Brie, banana cake, bean dip etc) the guests had to figure out how the foods were related. I do a theme party with decorations. It has to have lots of food to keep them all happy. We always have a dessert bar at our parties. Everyone really enjoys it. Love Simply Juicy and would love to win!! You always have the best ideas Leigh Ann!! Every year it is our tradition to have a “Build Your Own Pizza Party” on New Year’s Day. We invite our friends and thier families to come over and make pizzas! My husband makes both the pizza dough and pizza sauce from scratch, and I assist the day of, with preparing the pizza toppings. (Yourhomebasedmom has her dessert bars, we have our pizza toppings bar.) Our guests are then invited to the kitchen to place their toppings on their masterpiece and my husband bakes them to perfection! The party starts at 12:00p.m. and has lasted until the last person is served at 11:00p.m.! My husband has been known to make at least 26 pizzas by the end of the day! What a wonerful way to bring in the New Year with friends, food and fun! And I’ve had the joy of being invited the past few years. Can you say “super-yummy!” My favorite part is sitting around talking with everyone while you wait for your mater piece to be baked. If you’re really nice to the cook, he’ll give you a bowl of gravy to dip your slices in as you eat. He make the BEST tomatoe gravy I’ve ever eaten. We have a big crab feast once a year, and years ago our friend gave us a set of these wonderful big flat-topped resin crabs! So for the party, I put them out on the food table & put some dishes that folks bring on top of them to add height! What a fun idea! Sometimes, depending on the topic, I have people dress up for the party. EX) Did a book club party on the Nicholas Sparks book, The Wedding, and everyone came dressed as if attending a reception. They all brough their own wedding pics and I made a wedding cake for dessert! To make a party more festive, I think getting the guests involved is key – whether its interactive with the food or playing games or helping out in another way. Keeping guests busy is always best – they feel like they are part of the event more. I try to keep things simple so I can enjoy the party too. Simple things to make a party festive include using small, beverage napkins; greens or flowers tucked around food trays; drink glasses you normally wouldn’t use (ie champagne glasses for your lemonade bar, stemless/plastic wine glasses for fruit smoothies around the pool, etc. ); menu written out on a decorative stand. Love the idea of a juice bar! And love the shape of the Simply Cranberry containers. We love doing dessert bars in lieu of or in addition to appetizers. I dig doing lots of snack foods. Love the idea of juice bar! Genius! We like to make our party’s more festive by playing games! oo this is such a cute idea! Perfect for a brunch! The food has to be homemade and delicious and the serving ware has to be fun! Next time you should try a lemonade bar. My friend did this at her birthday party and it was awesome. She had normal lemonade with different purees to mix into it. she had strawberry, blackberry, kiwi, raspberry, peach, and a cucumber lime -that was delicious- there were other yummy flavors that I can’t remember right now. 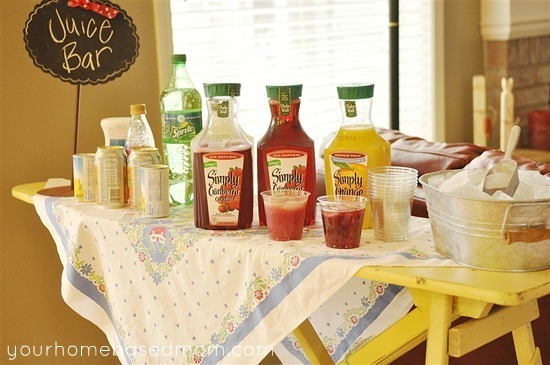 I really love the lemonaid bar idea and can’t wait to try simply cranberry…I love thier orange juice! For parties I just like to hang out…good food, good friends and games. I love decorating for our parties! Recently we did a wonderful Italian Soda bar using LOTS of you fun ideas. It was SO much fun. I love parties where people get to choose what they want and what to add. Love the way you set up the juice bar. Just another idea and why I can’t ever throw anything away! with a great music soundtrack! At parties, we often play our own version of Scattegories. So if you split into 2 teams, Team A creates 20 different words based on the theme (eg, Cinco de Mayo), and Team B also creates 20 different words. Then the teams swap words and they have to act out/guess each others. So much fun! I love theme parties and when my kids were little, I always used a theme for their birthday parties. Some of my favorites were; A Teddy Bear’s Picnic, Come Dressed As Your Mother, Pirate Party, and A Story Book Party. If I’m contributing to a party at someone else’s home (like a potluck), I always bring bread. Everyone else is going to bring chips or fancy cookies or sodas. Everyone will remember and appreciate the fresh loaf of delicious bread. I make our parties festive through special decorations. Love the idea for a grilled cheese bar! colorful decorations! Thanks for the chance to win! I love decorating with a theme to get a party more festive! 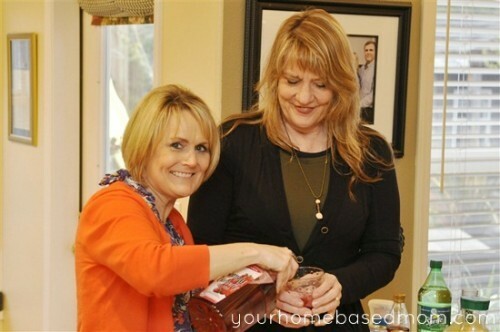 Always love to have guests into our home and I have used some of your ideas, Leigh Anne. Being impulsive, I often call friends at the last minute and invite them over for games and snacks and so throwing something together with what is in my pantry/refrigerator can be interesting. Can’t wait to try a Juice bar. Fondue always makes a fun and festive party! I love to spruce up a get together by adding fresh flowers to the table! I think that adds so much! Leigh Anne, you have some of the best get together ideas! We often do games and snacks! Love your ideas! I love to pull out my great grandmother’s dishes or my mother’s china and some of my other antique dishes I have for serving and eating. Just seems to make the occasion special. This makes anything served special. I like getting my kids involved with our parties. My boys have snow cone maker and I buy them sugar free Torani syrups (with a pump) and they set up their own snow cone booth in the backyard. It keeps the kids entertained for a long time and since it’s sugar free & outside I don’t worry about it. I like to have my kids make place cards and any other table decorations that they’d like to. We also love to go all out on the appetizers and dessert! I love your posts! My favorite of the “Simply” brand is the Raspberry Lemonade! My secret? Invite interesting people and let them speak for themselves… Because you know my decor doesn’t! The best thing about a party is the company. I like to keep things simple but yet fun and cute. I want to create lasting memories and that’s why parties are so much fun. Every party should have a theme! I like to have the food, music, decor, and sometimes even the dress code match the theme. I love all of the “simply” juices! I like to make sure there are lots of fun decorations and things to do (like make your own cocktail) because those kind of things always start conversations! My favorite way to make a party more festive is to have a theme. i”ll have to try the Simply Cranberry Cocktail. I like all their other juices. My favorite parties also have themes. I like doing food for book club parties and trying to figure out food that goes along with the book. Of course it is all about the food and drinks! Sometimes a good game or activity can make things really fun but if you have good fun and great people usually talking and mingling is more than enough fun! I love the juice bar and the grilled cheese bar…I like variety and these are both fun and different! can’t wait to try them at a party of my own! I confess I don’t entertain very often, mainly because I have a tiny kitchen/dining area and use that as an excuse! My favorite get-togethers are outdoor barbecues and picnics where people can spill out onto the deck and yard and enjoy simple fare like burgers, brats, fajitas, etc… My best tip is to be relaxed and enjoy yourself, then your guests will too. I love decorating for the theme of the holiday! I use simple serving dishes that will go with many types of decorations!! We usually throw themes parties too!! To make a party more festive we make the food match the theme. We also dress up to match the theme. For instance we just thee our daughter a princess party and everyone dressed up like princesses! When my kids were younger having an ice cream bar was lots of fun. Thanks for the giveaway. Most of our parties are kid-related and I’ve found anything with water makes it more fun whether it’s a pool party, hot tub night or just a big tub of water and a bunch of plastic cups for a water fight. Of course, you can’t forget good food! I like to play some kind of game that helps everyone feel comfortable and lets them know who all of the guests are. There are many creative ways to do this kind of introduction. I make the party based around a theme, like our housewarming/Halloween party was an “open coffin” so the food and decor was based around a vampire theme. I plan on having another party this year themed around mustaches and old timey cirrus fare. yay! so fun to see how this turned out!!! I like organizing games or crafts to all the kids busy so parents can have a nice time as well. I love having fun food and drinks and of course many many many fun decorations! They all make a party fabulous! We like to play interactive games like Scattergories, Apples to Apples, Pictionary, and a few others! I put on upbeat music and lots of snacks. Thanks for the review and giveaway. I think having a fun color scheme makes a party feel more interesting…I love combining bright pops of color like turquois and red! Our last family party we had everyone list a few words about each of the other family members..words that we though described each person. My sister compiled the words and put them on a photo placeholder for each of us. It was fun to read what everyone thought about me and it was a great memento to take home. I will prepare lots of games! This juice bar is such a fun idea! When I have a party, I focus on making sure the food table relates to the theme…and a cupcake tower is a must! It’s all about the decor in my opinion! I love decorating with bright colors! I use simple serving dishes/trays so all I need to do is focus on the linens and flowers/decor! I love a mix of simple and fancy dishes – the fancy ones make the whole party more festive! I would just use a variety of flavors for my guest to try and decorate with an Island theme. By bringing together people that don’t know each other…always fun after everyone gets comfortable. Music definitely helps make the party more festive! Interactive games usually help. My husband got me a Wii when they first came out, and its most fun when we have people over. I like to make parties more festive with fun decorations and Bly involving the guests..teaching them the hula for example. I think a good party has fun people and delicious food, and good conversation. What a clever idea! I like making everyone work :)! So fun a juice bar! I love all Simply products, what a great party! I think every party needs lots of color to make it festive. It immediately sets the mood when a guest walks in the door. Music is always important to me in setting the tone for a party :). Love the juice bar idea! For holiday parties, a cute little themed goodie bag is a treat to hand out to guests as they leave. The juice bar is a very fun and interactive way to incorporate your guests into the party. That will leave the hostess available to greet other guests as they arrive. The guests and the food are the stars of the party. Favorite place to entertain is on our deck for a b-b-q. This atmosphere, some sumptious food and the people are all we need to make a great party. Its kinda funny that you have this give away as my hubby’s favorite is Simply Limeade and it is always front and center as our guests arrive. Great the guests and make sure they feel special, enjoy the party yourself, you set the tone! I’m all about setting the mood with fun decorations, and yummy food. I love the planning process! A gift card would be great ~ then I could throw a party!!! 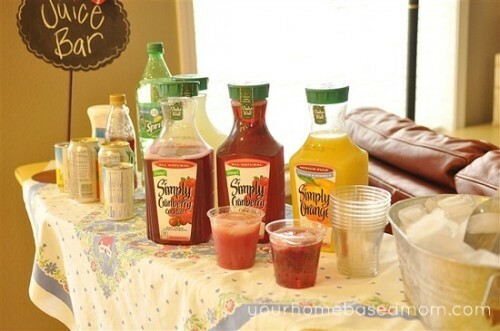 simply limeade, yummy food, family & friends – – perfect party! A party would not be complete without food, drinks and good conversation among friends. A little wine and some music can really make a difference too. Serving things family style or buffet style loosens things up a lot. Conversation cards are fun, too. Honestly, I don’t ever have parties or get-togethers. I think all the time that I want to be a “party-planning/party-throwing” kind of person but I get scared every time I think of trying it out! I love giving door prizes and party favors! Love the juice bar! I love planning parties especially for my kids’ birthdays! I usually come up with a theme and research games, food, and crafts to go along with it. Food is always important because they are very hungry after fun games and crafts. we like to try a new recipe or two each time we entertain. What a great giveaway!! I am going to put this juice on my shopping list right now. Great idea- love the vintage ironing board. Cranberry juice and ginger ales is one of my all time favorite drinks! good food and good music make a party quite festive! Definitely some music and delicious food make our parties more fun! Fun appetizers and finger food and good music help get a party rolling! This looks so good! I like putting up crepe paper and having some sort of game/prizes to make it more festive. When I have guests for dinner, I like to have the table set and decorated before they come. I also like to use colorful disposable napkins. Your pics are amazing of the parties you throw. I wish I had your creativity and energy. I love the Simply juices! 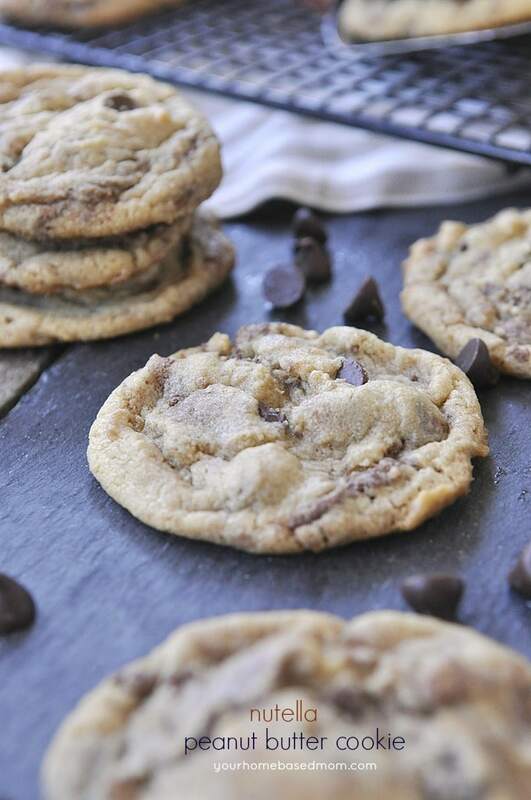 A gathering at our house is never complete without a dance party and a delicious dessert. When I do a get together I really try to keep it simple and let my food do the talking! I get overwhelmed when I try the ALL-OUT approach! That juice bar is the cutest! I love having drink stations at parties. To make things more festive I always fully commit to a theme of sorts and carry that out through food, drink, and decorations. And music never hurts! Simmer in a pan until done! We love to decorate for the party and keep it in theme! I always make sure I have plenty of different foods to make the party festive. My favorite way to make a party or get-together at my home more festive is selecting a theme but with simple decorations. I love to prepare homemade finger food, nice dessert and drinks. Love your juice bar idea, will plan it for my next party. Thanks for the giveaway. LOTS OF HOMEMADE FOOD & FUN AT THE BEACH! I make sure there is a variety of food and drinks. lots of snacks and cocktails. O and don’t forget the music. I love to have spooky Halloween party’s.. I love to themed potlucks. 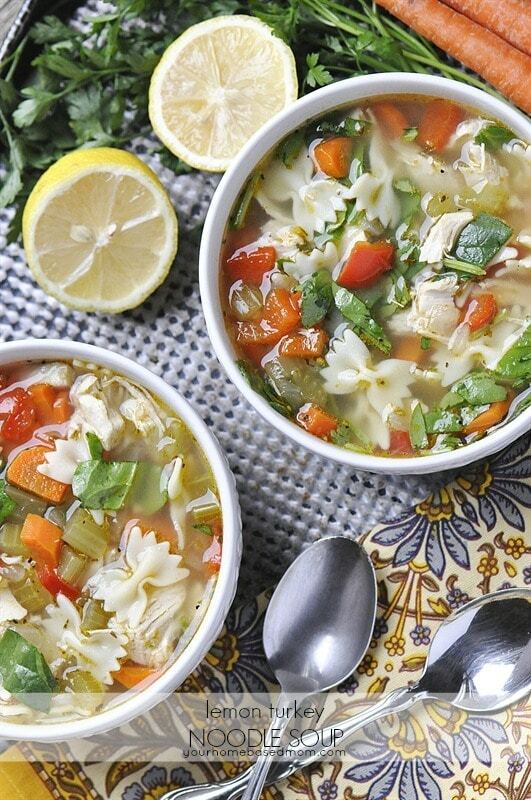 One time might be slow cooker foods, everything from appetizers to desserts. Another time might be sandwiches. It’s fun to see how creative we can be within the theme. Parties are more festive with special bite size snacks and board games to get people interacting. I love the juice bar idea…will definately try that idea! I love to pick a theme and then get decorations to match as well as food and drinks. Getting ready to host a hawaiian party for my daughter’s 6th birthday! I like to find one unique thing to do that is unexpected. I have done hot dog bar, chili bar and I am trying the Italian soda bar for my son’s grad. party this month. I think the best way to make a party festive is to include friends!! Even if you’re having a simple BBQ, having good friends attend (and feel welcome) is key to a festive atmosphere! An ice cream sundae bar is a great way to make any event festive! Theme, decorations and music are always great; but fabulous friends/family make the party a real party! Keeping it simple so that I can interact with guests rather than busy cooking, and cleaning up, works for me. Decorate with fresh flowers. Always festive to me and to my guests. I want to win so I can beef up my silhouette cameo fund! oops, I forgot to answer the question, I love a theme and a fun party favor for everyone to take home! I like to add flowers and food labels! A great way to make a party more festive is lights! I love to string up lights all over the house and yard (weather permitting) and not use any other form of light other than maybe a scented candle or two. It really creates a fun and intimate atmosphere! Plenty of appetizers and napkins!! I like to do a food bar with everyone can pick what they want to eat and I free to enjoy everyone. I add festive music and decorations to create the right atmosphere. I love making the party a pot luck with a theme to see what people come up with to bring based on theme! There’s always LOTS of food and we like to play games.